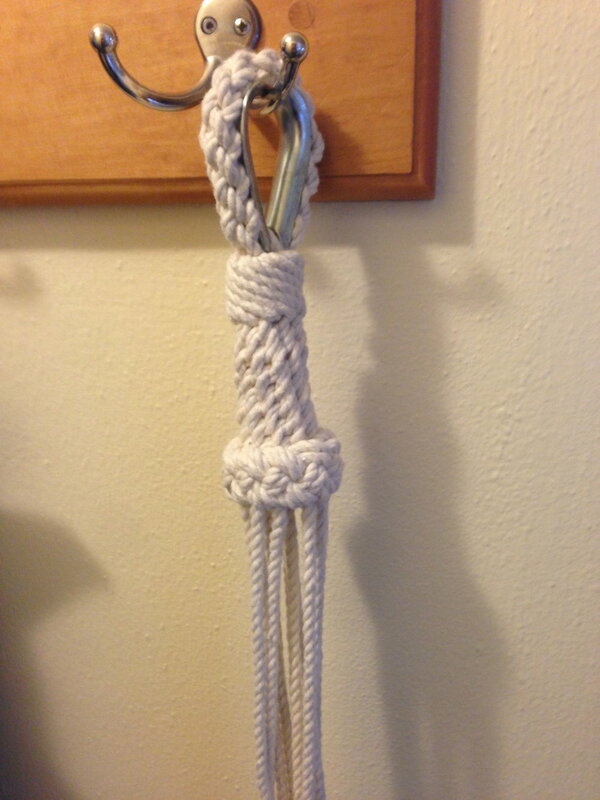 In this post, I'll be showing you how to make a plant hanger out of rope. 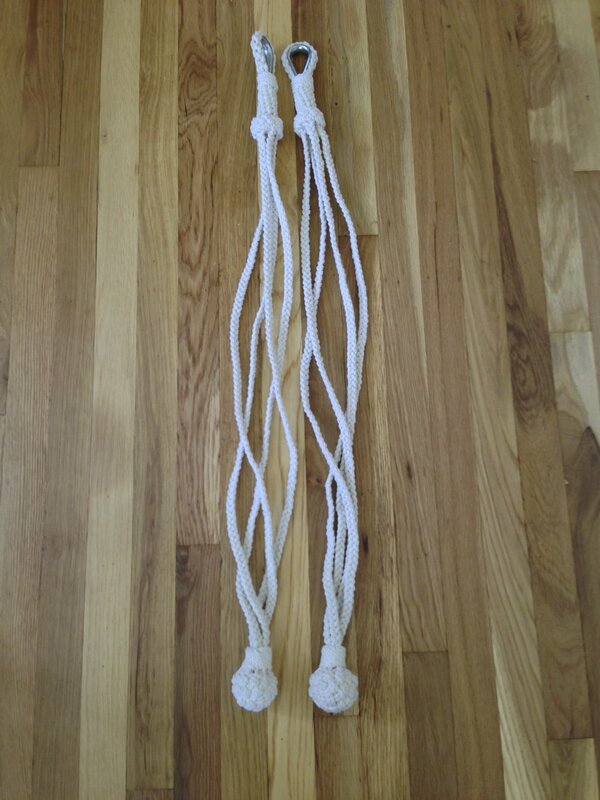 A quick search on Etsy for rope plant hangers yields several macrame plant hangers, which generally focus on hitches and square knots. I'll be showing you how to tie one that is made up of braids and decorative knots such as the Matthew Walker knot and Turk's head knots. Each braid and knot that I'll be tying could be a post of its own, so I won't be focusing on the specifics of tying each knot. Instead, I'll be taking you through how they are all pieced together. Let me know in the comments if you want more detail about a specific knot or braid! 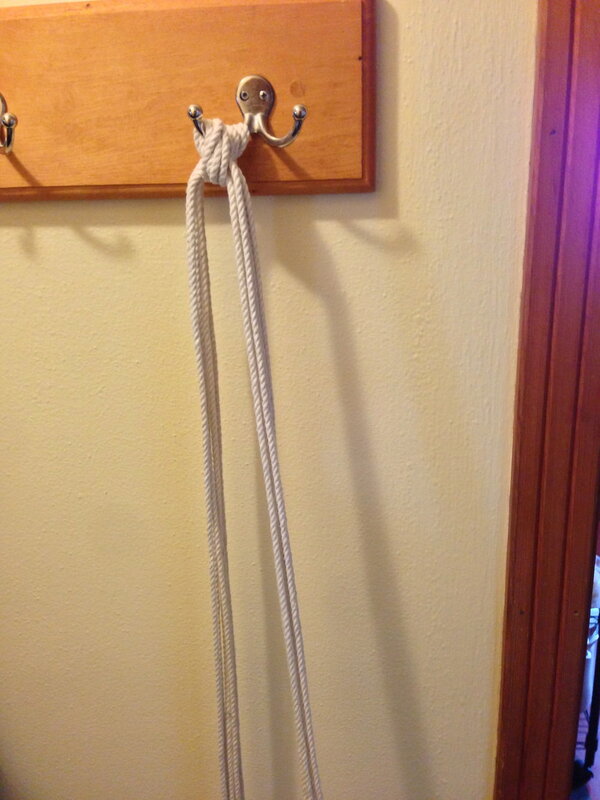 120 feet of 1/8" twisted cotton rope - make sure you select 1/8" spool option (300 feet). 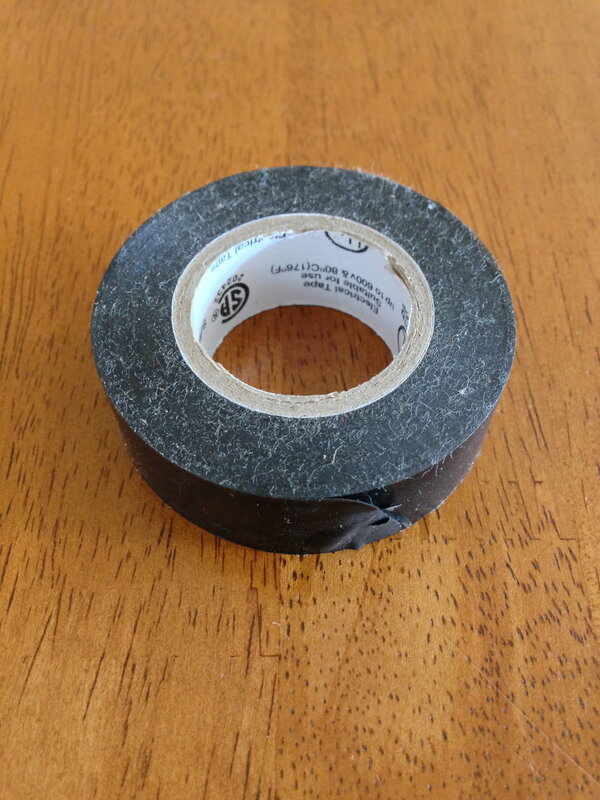 Electrical tape - we'll use this to whip the ends so the cord doesn't unravel. Thimble - this is what our plant hanger will hang from. 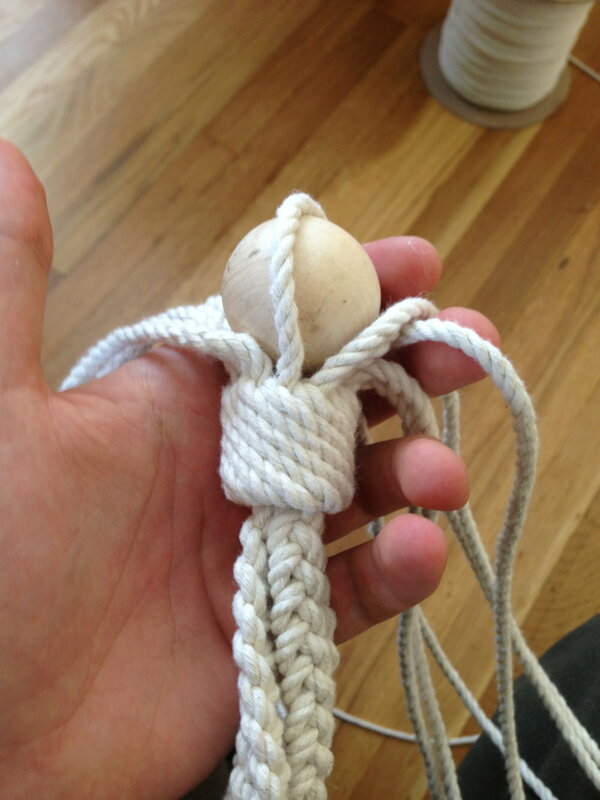 Wood ball - we'll use this as the core of the last knot that we tie. 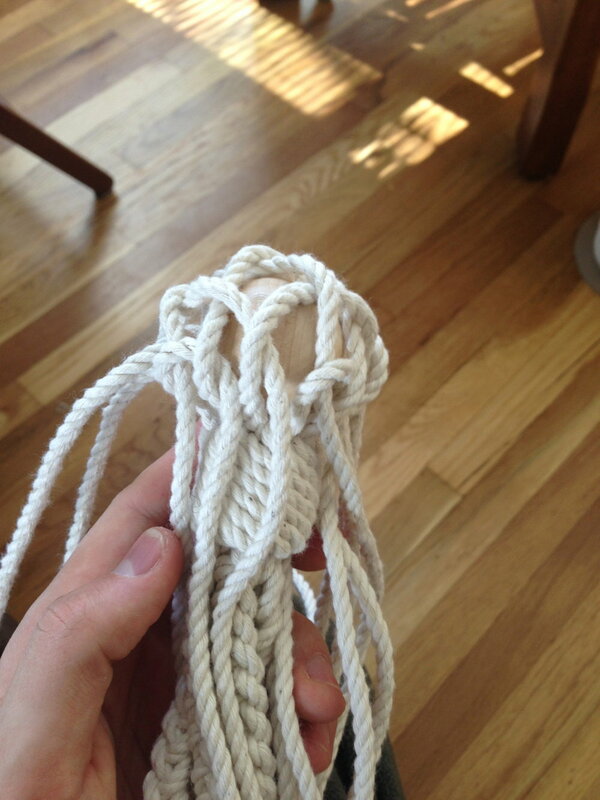 Ashley Book of Knots - highly recommended for knot tying in general and needed for the final knot on the plant hanger. I buy this buy the spool. You'll need about 125 feet of it. 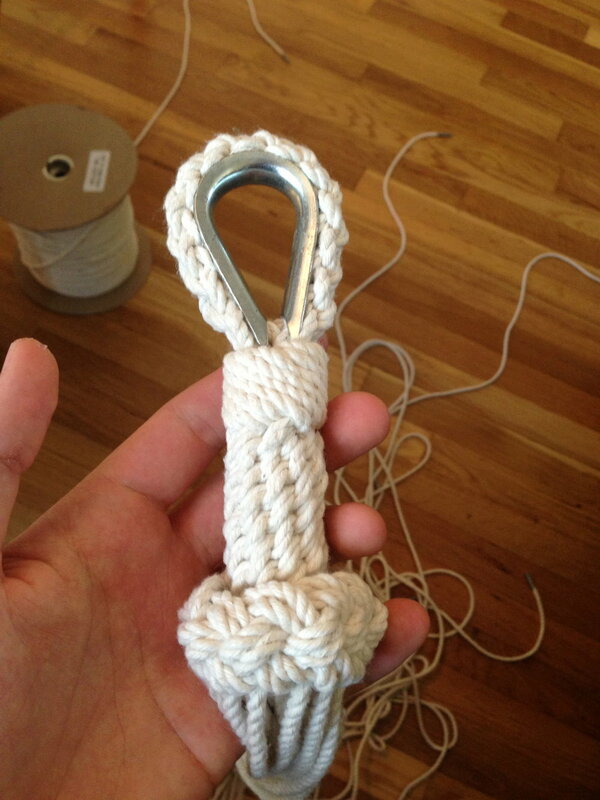 We'll use this to whip the ends of the rope so it doesn't come unraveled. We'll form a braid around this thimble, which will form the loop that the plant hanger will hang from. This will be the core of the final knot of our plant hanger. We'll need 6 strands of 20 feet. I lay out all 120 feet, 20 feet at a time, just going back and forth 6 times. 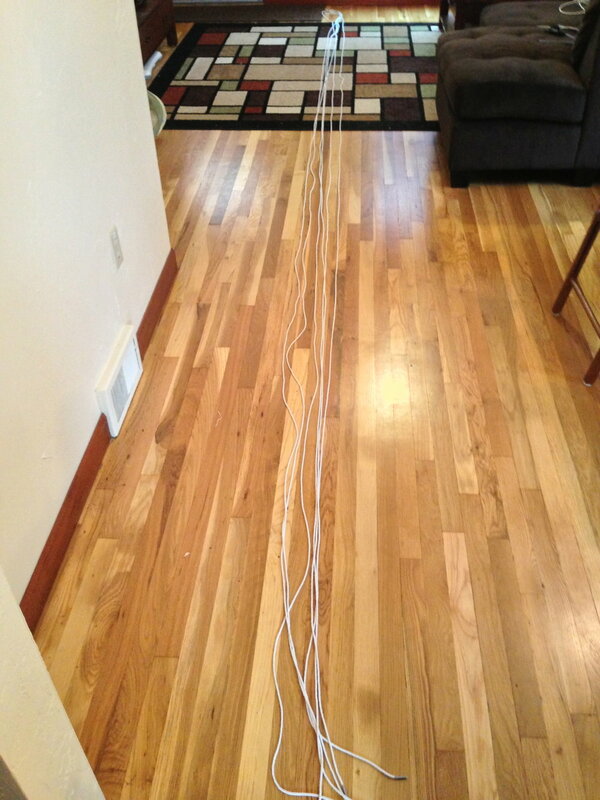 Then I put a couple inches of tape at the 20 foot lengths and cut the rope in the middle of the tape. We'll need size 20 foot strands. I layout all 120 feet, going back and forth. Then I place short lengths of electrical tape at each bend so I can cut it without it unraveling. A short length of electrical tape wrapped around the rope allows for easy cutting without any unraveling. Cut the rope in the middle of the electrical tape so both ends are wrapped. The braid needs to go all the way around your thimble, so to see if you've braided enough just loop it around the thimble. When you're done braiding, cinch the ends. You can use electrical tape if you like. 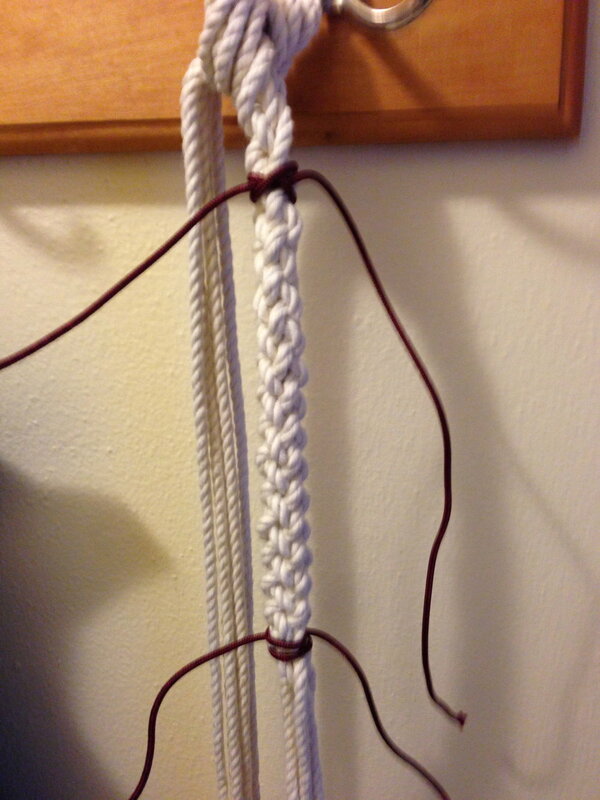 In this example, I've tied constrictor knots using some extra cord I had laying around. Put the braid around the thimble and cinch it as well. 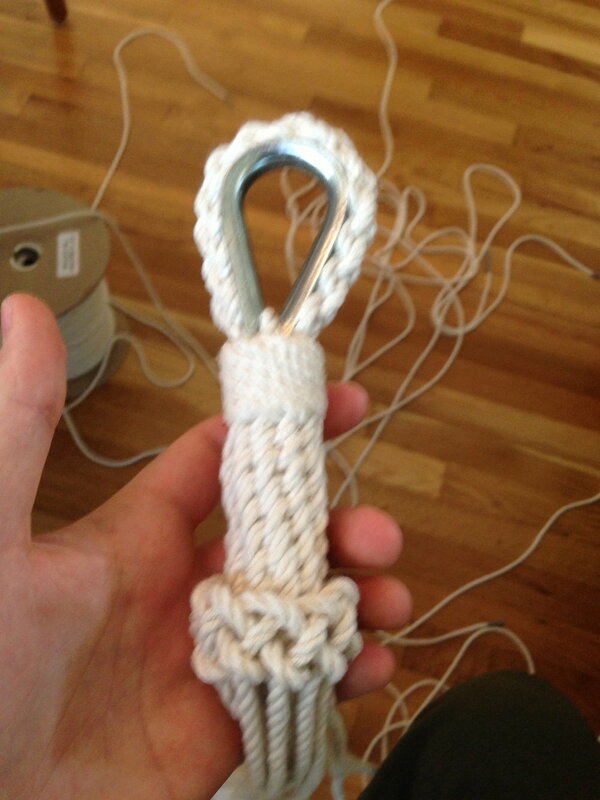 I attach the rope to a hook a little less than half way through the rope using 2 half hitches. Tie a 6-strand round or half round braid. I used constrictor knots with the spare cord laying around, but you can just use electrical tape. Wrap the braid around your thimble, then cinch it down using electrical tape or some spare cord. The 12-strand Matthew Walker is very similar, it's just trickier to keep everything in order. 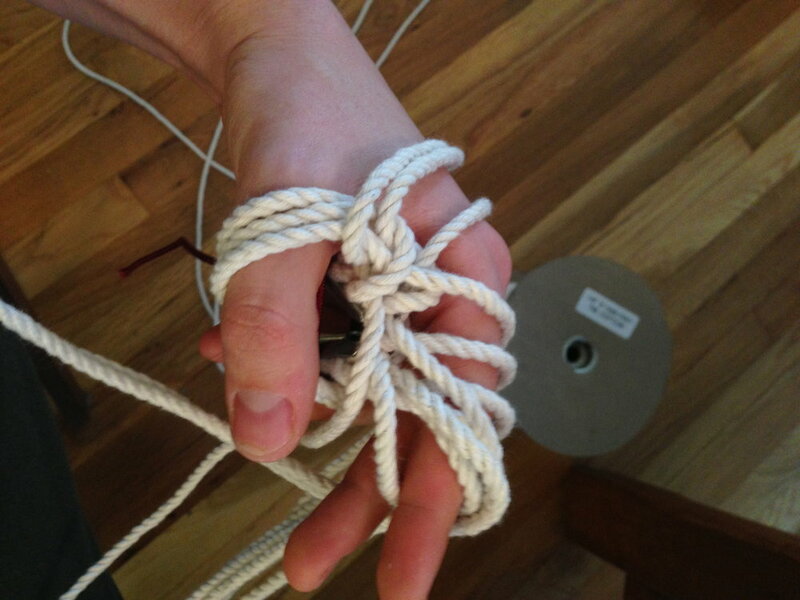 While tying it, I recommend keeping the knot much looser than in the tutorial above. 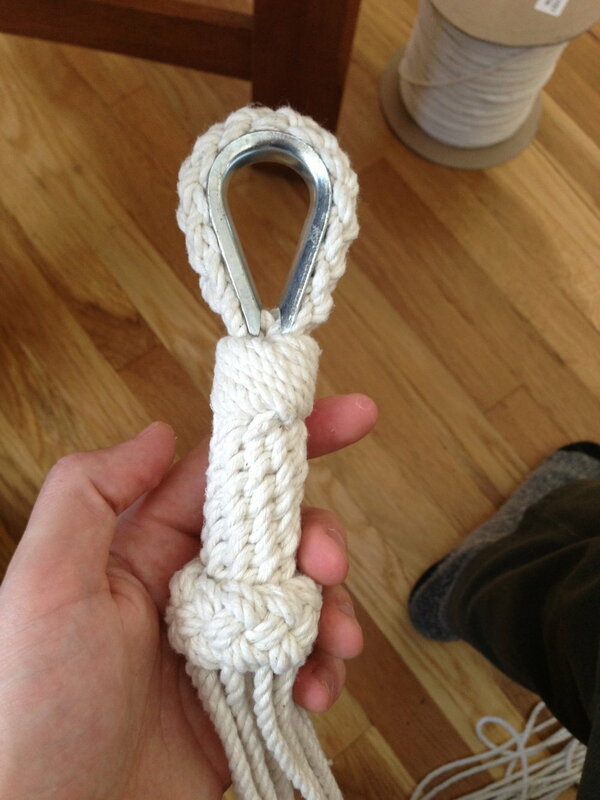 It makes it easier to get the knot completely tied and then you tighten everything down. Once it's loosely tied, you can remove the cinches that are preventing the braid from coming undone. 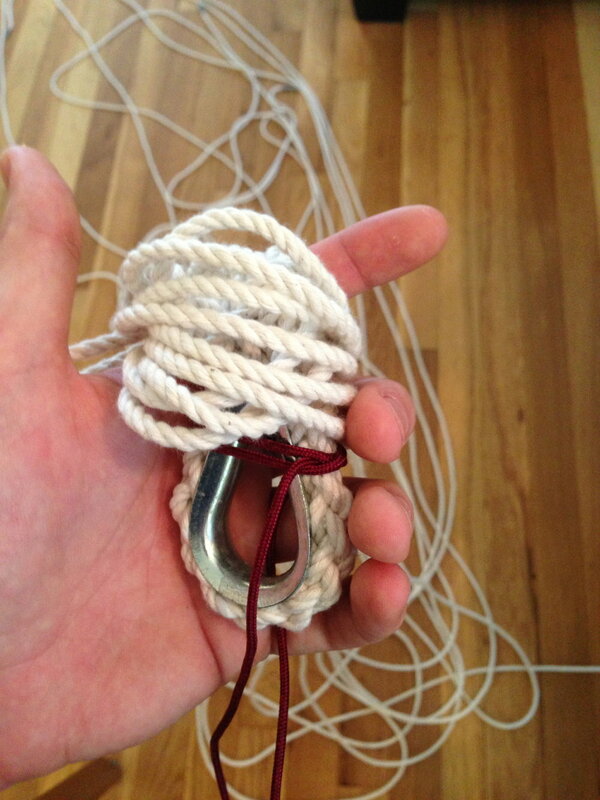 Leave the cinch around the thimble until you've tightened the Matthew Walker knot. 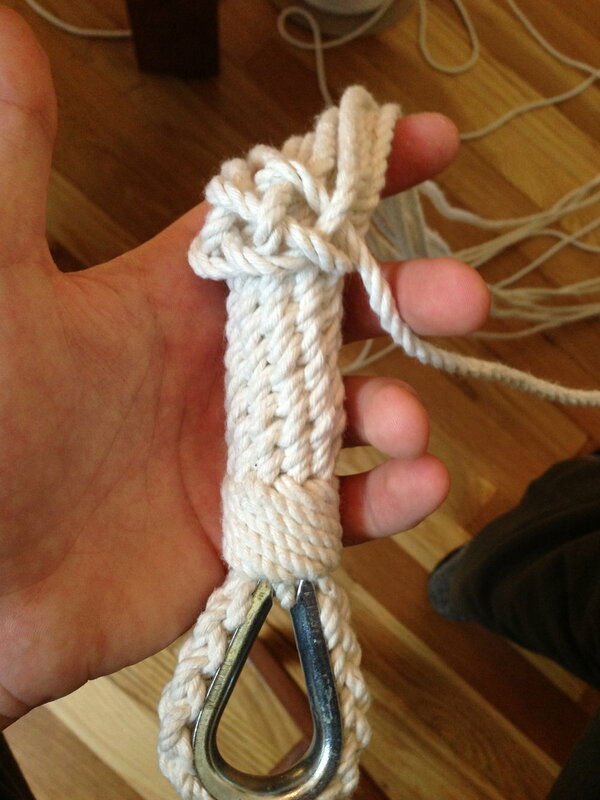 With 12 strands, the trickiest part of the Matthew Walker knot is tightening it up evenly. Take your time and tighten each strand slowly and evenly until everything is really tight. Once it's tight you can take off the cinch around the thimble. You can do it as much or as little as you want. The important piece is to do enough so that we have a core for our next knot, which will be a 4 part 12 bight Turk's head. It generated the image of the knot grid. You can see that each strand goes down to form a bight and then back up and goes under the 3rd strand down for it. You'll then start weaving over and under strands that you've previously laid down. Just try to follow the image. My program also generated the instructions below, which may be useful for some (though it only labels bights so you still have to know that you're going to the 3rd strand down from the one you started on). 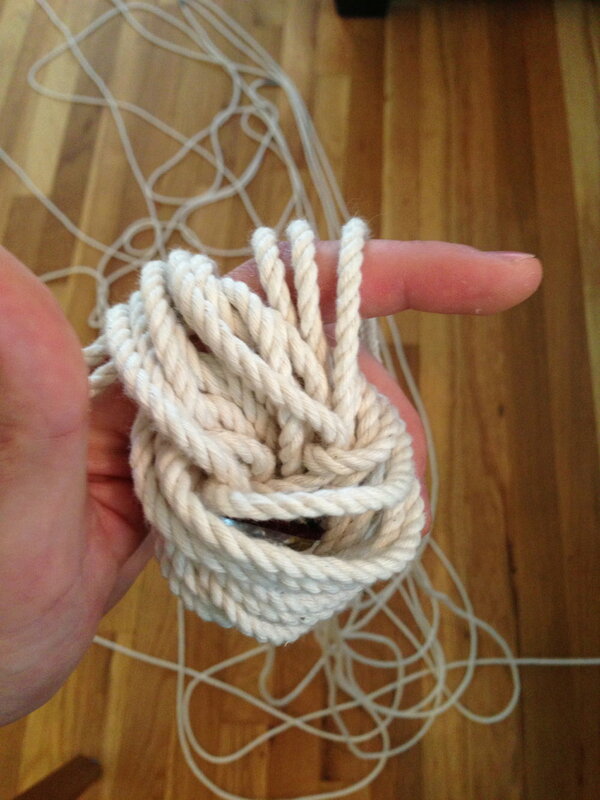 After you finish the knot, double up the knot by following it around again and then tighten everything up. 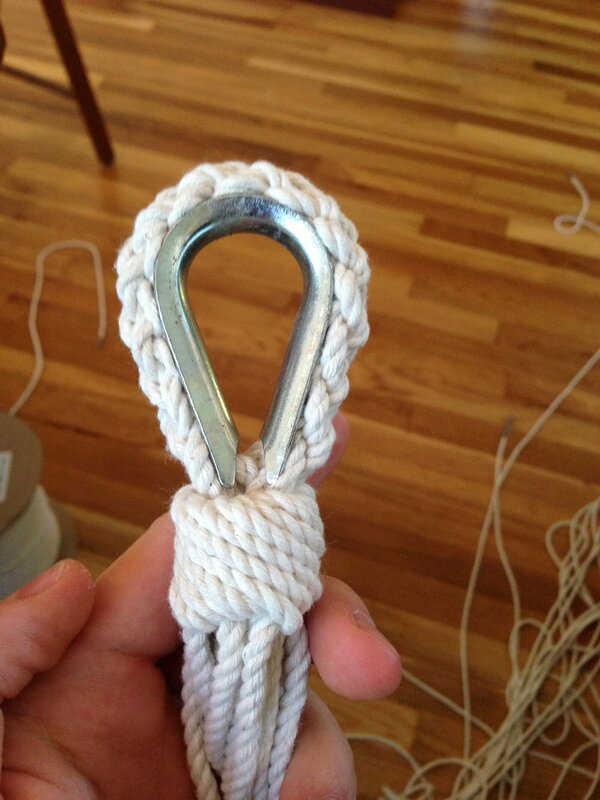 Hook the thimble onto the hook that you used for braiding. We're going to be making four 3-strand braids. 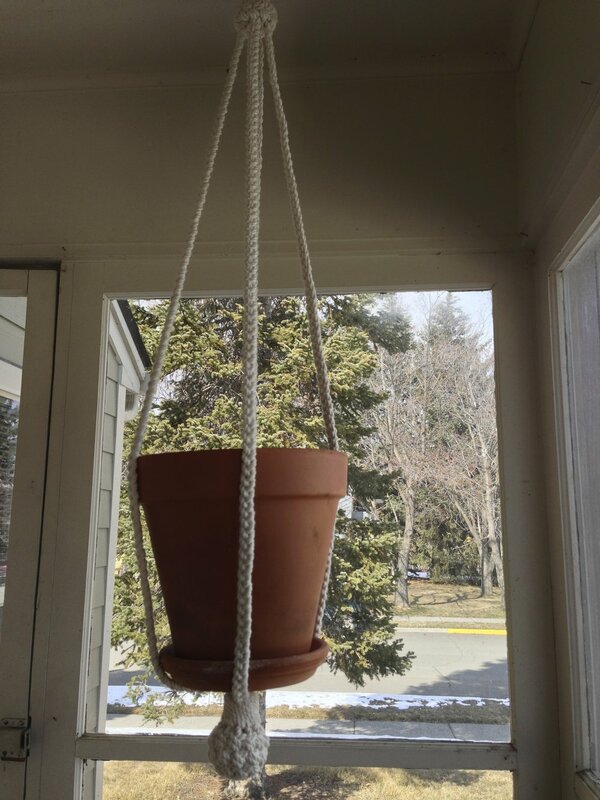 You'll want to braid until it's as long as you want your plant hanger to hang. Now take all four braids and bring them together around a pencil and cinch them. The pencil isn't totally necessary, but I do it to help make sure I don't cross the braids. Once they're together, tie another Matthew Walker knot. Then remove the cinches. This knot is #967 in the Ashley Book of Knots (a must have for any serious knot tyer). Just set the ball on the Matthew Walker knot that you just finished, then tie this knot. Once it's tied, continue to do a few extra overs and unders until the ball is evenly covered. It will still be loose and have gaps, but just make sure everything is even. Then you can double everything up, then tighten it down. Then you can trim the ends and poke them down into the knot so you can't see them. 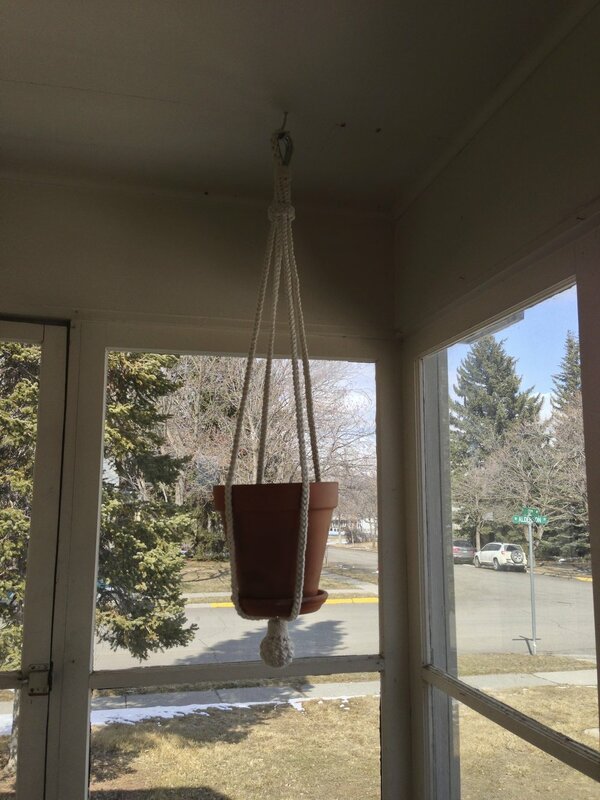 Now you can put a pot in and hang it up! Thanks for following along. Let me know what you think in the comments below!